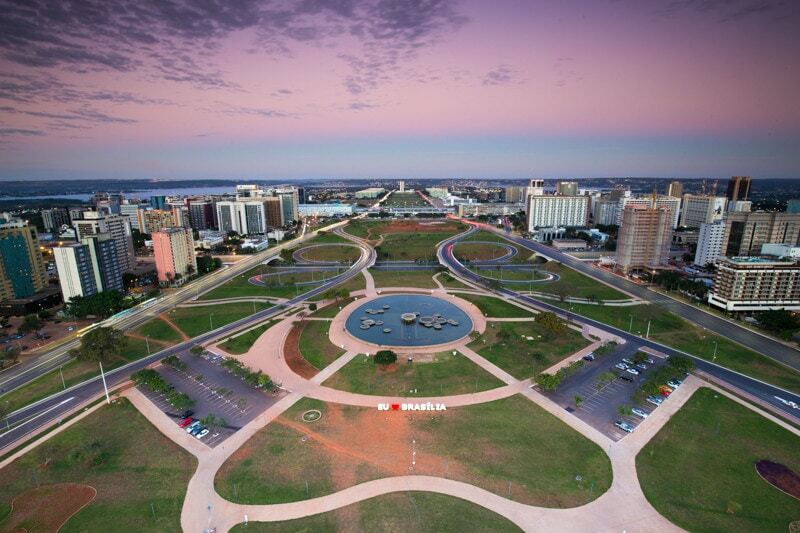 Sure, Brasilia might not be high on most traveller’s destination lists for their visits to Brazil. 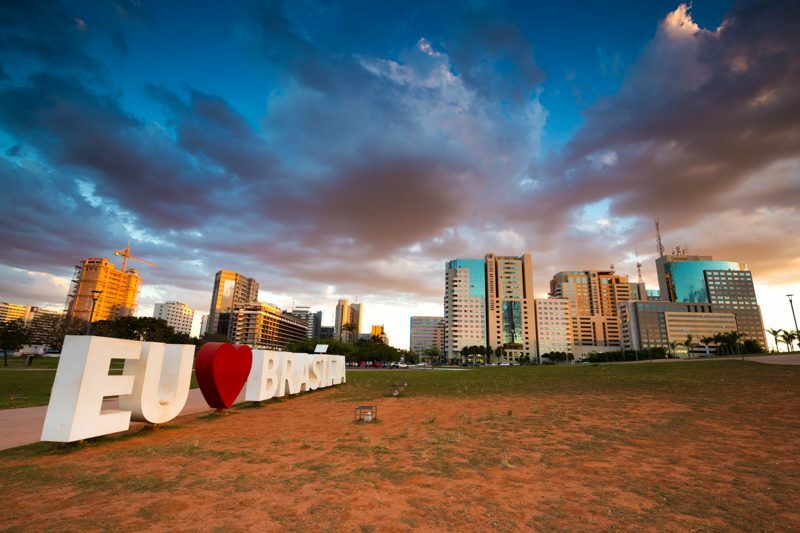 And the truth is, that aside from a couple museums, there really isn’t actually that much for tourists to do or see in Brasilia. 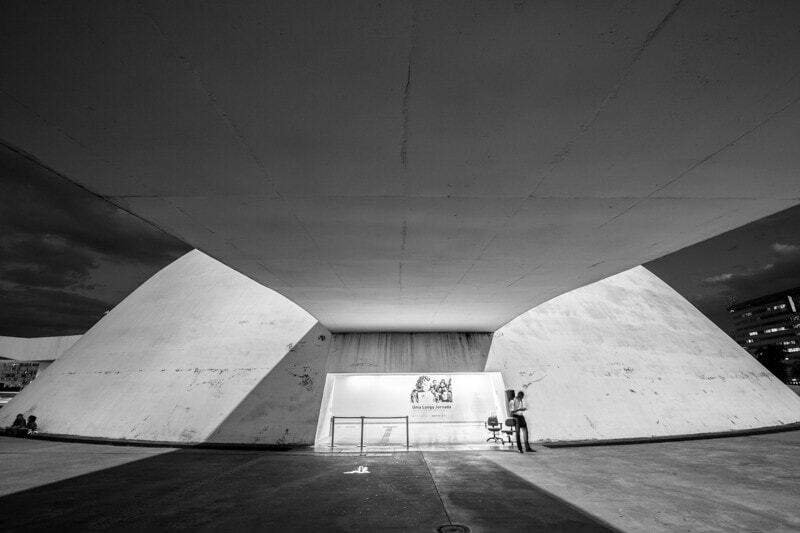 For photographers, however, this is an architectural photography playground. And, in hindsight, I left myself with far too little time in the Brazilian capital. The truth is that I really could have spent a week photographing the different buildings and public spaces. In the end though, I only had time to photograph two locations. I’m already dying to go back and shoot more places in the city. 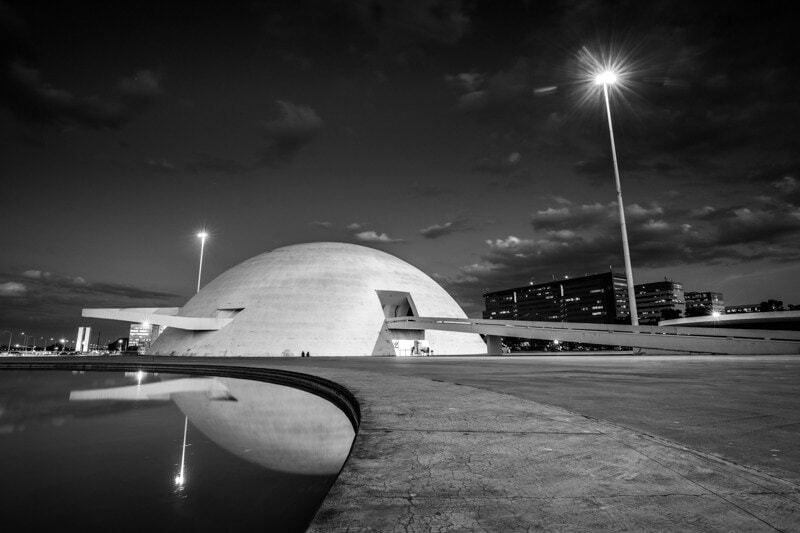 I think that I’ll just describe a couple of the images I took in Brasilia and explain how I shot them rather than a more traditional article. 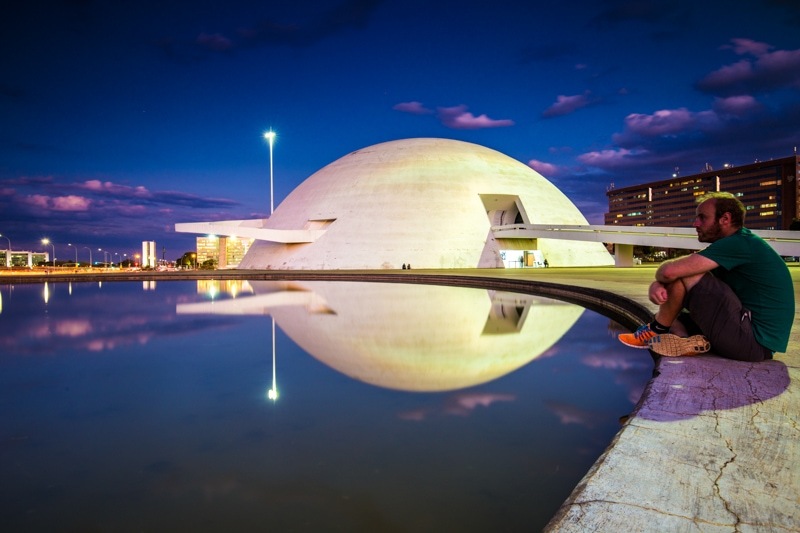 Considering I only had time to shoot two different times in Brasilia, I think I did get some cool imagery. I’ll share my favourite 4. 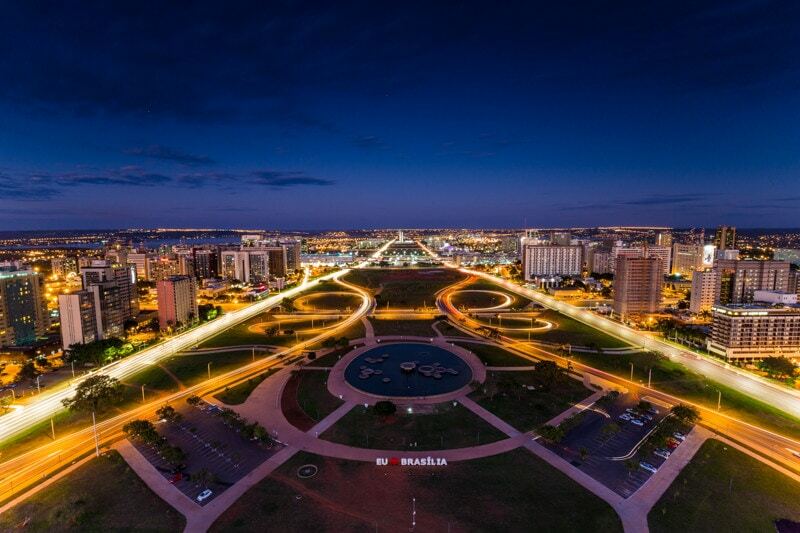 I actually shot this image on my second day in Brasilia after shooting the first evening from the top of the tower itself. From a technical side, this was a fairly difficult image to shoot. Taking a photo right into the sunset means that you have heavy exposure issues. Without any filters, if you were to shoot this you’d have to choose to either expose for the sky, or the buildings and foreground. The results are usually pretty rough. 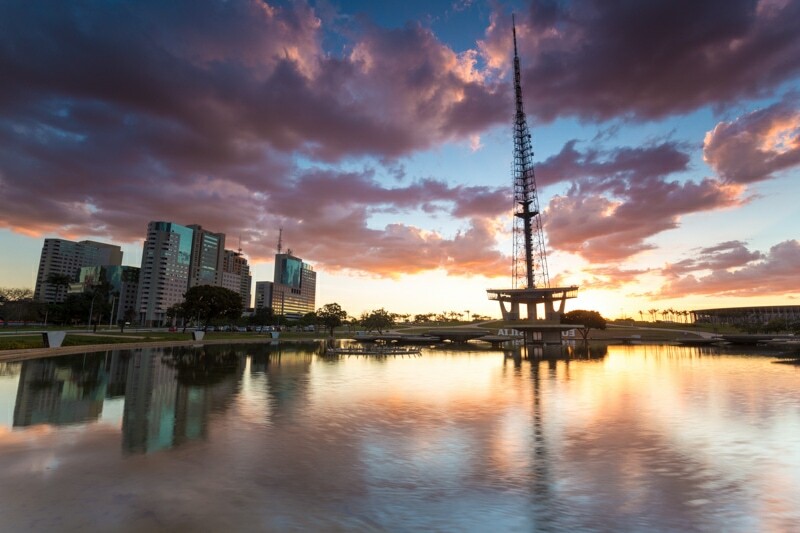 I used a 4-stop grad ND filter to even out the exposure and the photo came out really nice as a result. This was my welcome to Brasilia. I wasn’t even sure if I could photograph from the TV Tower, but was pleasantly surprised to find out that the tower is actually open until 8pm. It wasn’t easy to shoot there, though. The platform floor shakes a bit and squeezing my camera through the only whole in the platform’s fence was tricky. But, in the end it all worked out. To get these really long powerful light trails created by the traffic in this image, I actually shot this image with a 71 second exposure. Sometimes, to get the best shots we have to push our cameras past their standard settings. 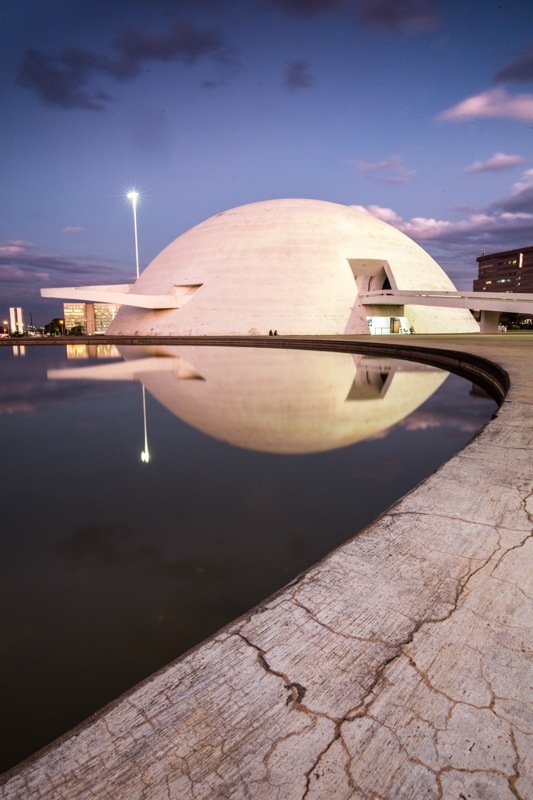 This beautiful building is actually the reason I went to Brasilia. I just had to photograph it. I absolutely love the radical outer-worldly style of the architecture in Brasilia. And, I really do need to get back again and photograph places that I missed such as the Cathedral. I am, however, very happy with how my images came out from the museum. There’s nothing special done with this image technically. However, from a composition stand point I used the cracked ground as an anchor, and the curve of the pool as a leading line to the museum. I think this was my favourite composition of the shoot, but the light was better on other images. This was actually a really fun image to take. Just by chance, this police car drove up and parked there. Realizing the opportunity for a cool shot, I went up to them and asked them if they’d be there for a while. They worried they were in my shot and asked if they should move. I told them the contrary, and as they ate their dinner in their car for 10 minutes I shot long exposures. This image was a 231 second exposure, and that’s how I created that really wispy look in the clouds. I also shot this image at f/16 because I wanted to star that light in the middle of the frame. 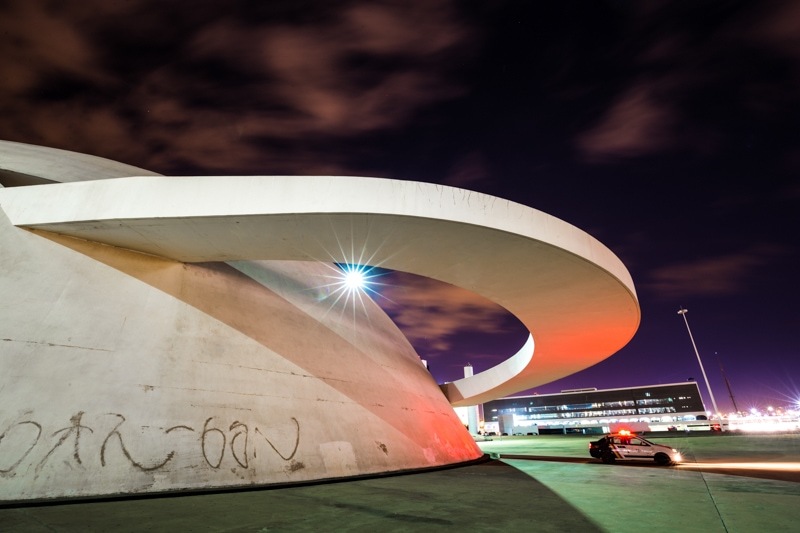 Here’s a bit of a file dump from some of the other images I took in Brasilia. Again, I’m pretty pleased at the images I came away with in such a short time. I was meant to shoot in both Rio de Janeiro and Sao Paulo. However, rain and work drenched my plans and I didn’t actually shoot anything there. Luckily, I’m back in both places next month. So, on the photography blog the next article will be from La Paz, Bolivia, and then I’ll have some stuff from the south of Bolivia as well. Lots of fun on its way, so stay tuned.